I recently started volunteering at the Sustainable Food Center. My first major task was helping with a project to test several recipes for the revision of the Happy Kitchen cookbook, and important part of the SFC’s Happy Kitchen cooking class program. I picked Smoky Black Bean Salad and Cranberry Sauce. I had a lot of fun doing this and testing the recipes with different groups to get their feedback. This particular recipe I’ve made my own, by upping the chipotle and cilantro, and adding some more color with the carrot and red bell pepper. The salad makes for a really nice, light meal paired with some soup or a vegetable dish, or by itself. Last night I ate a plate of this salad with some roasted acorn squash I had left over with some honey drizzled over the top. Yum! Healthy dinner after a nice run. First, rinse and drain the quinoa. Bring the water and salt to a boil. Add the quinoa, lower the heat to medium or medium low. Cover and cook for approximately 20 minutes, or until all the water is absorbed. Remove the pan from the heat, and allow the quinoa to cool completely before proceeding with the remainder of the recipe. 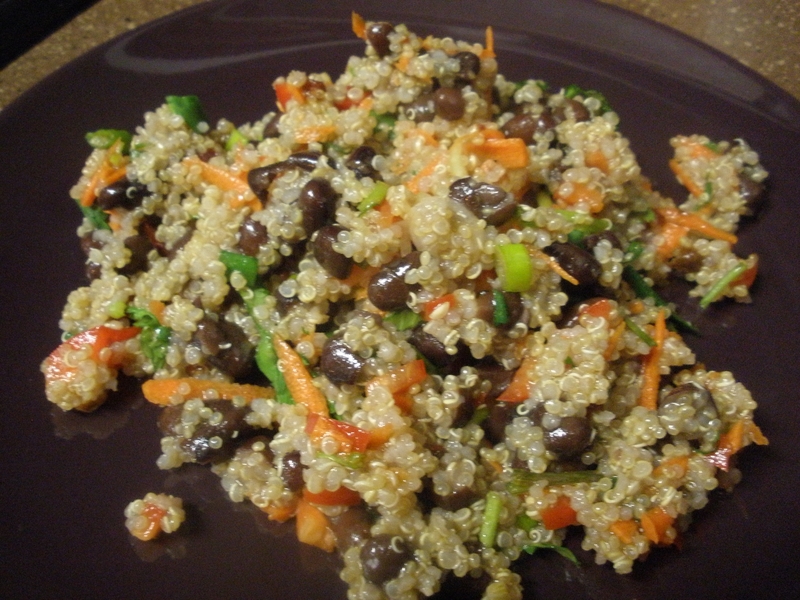 If you use hot quinoa to make the salad, the texture becomes mushy. 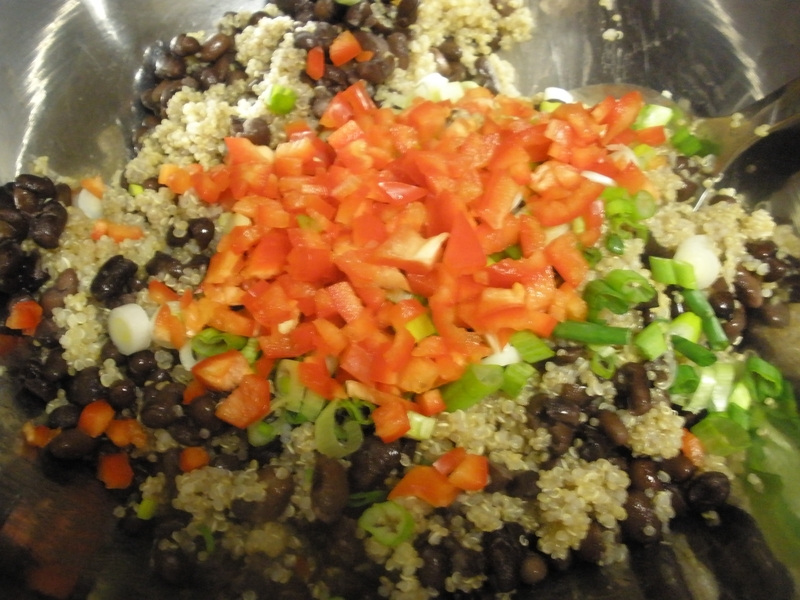 Place the quinoa in a large bowl suitable for mixing. Add the black beans, green onions, carrot, red bell pepper, and cilantro. Next, make the dressing. Combine the chipotle peppers, adobo sauce, olive oil, lime juice, garlic, cumin, and salt in a small bowl. Whisk together until everything is well combined. Add to the quinoa mixture and stir to mix until the dressing is well distributed. Serve cold or at room temperature. Use the salad within a week of making it.